MEDIUM 15 x 21 in. (380 x 530 mm) 18.5 x 24 in. THANGKA 15.3 x 21.3 in. (387 x 540 mm) 28 x 48 in. NOTE: The original brocaded version of the Sitatapatra (Tib. Du-kar thangka by Pema Dorje is now for sale. This brocaded thangka measures 28 x 48 inches (71 x 122 cm) and is priced at GBP £1,120.00. Sitatapatra (Tib. 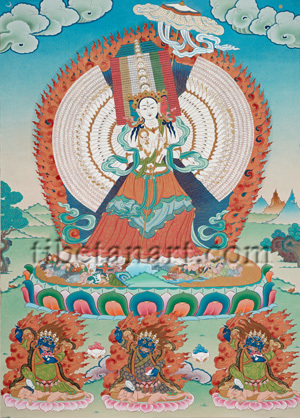 Dukar: gDugs-dkar), meaning the "White Parasol Lady", is one of the most complex deities in the Vajrayana Buddhist pantheon, with a thousand heads, a thousand arms, a thousand feet, a multitude of beings that she crushes underfoot, and ten million eyes that appear on every part of her body. Tradition relates that she originally emanated from the ushnisha or 'crown protuberance' of Shakyamuni Buddha, in his response to the need for all beings to be protected from the most malevolent forces. Thus Ushnisha-Sitatapatra, the "Crown Protuberance White Parasol Lady", arose in order to subdue all arrogant demons, to conquer all evil forces, afflictions, malefic influences and diseases, and to counteract the mantras of sorcerers and the curses of black magicians. In Buddhism the white parasol is a symbol of royalty and protection, with status being accorded to the number of parasols carried in a secular or religious procession. These numbers were usually three, five, seven, nine or eleven, with thirteen parasols being accorded to an enlightened Buddha, a chakravartin or 'universal monarch', and to the number of parasol-wheels that crown Buddhist stupas. Sitatapatra is youthful, beautiful, radiant and white in colour, with a thousand heads, a thousand arms, a thousand feet, and ten-million eyes that gaze out from all parts of her body. She stands in alidha posture above the golden sun disc of a multicolored lotus, with her left legs bent and her right legs extended. On either side of her two principal feet are her 499 other feet that appear as repeated outlines of her main feet, with the rows of her toes extending outward, and the rows of her heels extending inward. With her thousand feet she crushes the thousand fears and demons that she tramples underfoot, which here extend outwards in human and animal forms across her sun disc, with mythical creatures and the elements of nature appearing at their centre. She wears the eight golden ornaments, and her embroidered garments consist of a red sash, a billowing green scarf and belt, and a long pleated, triple-layered skirt of red, green and blue silks. To emphasize her protective function she is described as having either a thousand million, or ten-million and one hundred thousand eyes that appear on every part of her body in a variety of gazes. Some are glancing to the side, some are wide open, while others are bow-shaped, gaze forward in wonder, dart like lightning, are piercing, compassionate, smiling, enchanting or frightening. And from every pore and hair of her skin emanate fiery rays of wisdom light, which manifests around her divine form as her blazing aura. Her thousand heads are divided into five groups of two hundred that are arranged in a circular mandala formation: with her blue faces at the centre (top); her white faces in the east (front); her yellow faces in the south (right); her red faces in the west (outer right and left); and her green faces in the north (left). Each group has a different expression: the white faces are attractive, strong and joyful; the yellow faces are terrifying, wild and jocular; the red faces are abusive, glorious and frightening; the green faces are compassionate and peaceful; and the blue faces are wrathful and awe-inspiring. Each face has three eyes and is adorned with a five-jewel tiara and crowned by a blazing vajra. In this particular painting she has three principal blue, white and red faces, with ten progressively smaller crowned white faces stacked above her main white face. Descriptively manifesting above her thousand stacked heads are said to be: 'seven crowns, seven million perfect Buddhas, and seven white parasols'. Sitatapatra has two principal arms, and nine hundred and ninety-eight major and minor branch-hands, which are traditionally arranged into six radiating rings or circles on both sides of her body. Forty-eight major branch-hands appear in the first or inner circle, with a hundred and ninety smaller branch-hands appearing in each of the five outer circles. With her first right hand she holds a golden wheel at the level of her heart. Then the lower four of her major-branch right hands each holds a golden wheel, with ninety-five of her minor branch-hands holding golden wheels below. Her next five major branch-hands hold golden vajras, with ninety-five of her minor branch-hands holding golden vajras below. The next group of her hundred major and minor branch-hands hold jewels; the next group of a hundred hold lotuses; and the uppermost group of a hundred right hands hold crossed-vajras. With her first left hand she holds the golden shaft of her great white parasol and an arrow (not visible) in front of her heart. Then the lower four of her major-branch left hands each holds an arrow, with ninety-five of her minor branch-hands holding arrows below. Her next five major branch-hands hold bows, with ninety-five of her minor branch-hands holding bows below. The next group of her hundred major and minor branch-hands hold swords; the next group of a hundred hold rope-nooses; and the uppermost group of a hundred left hands hold hooks. Below Sitatapatra are three identical sibling aspects of Mahakala, who commonly accompany her and are collectively known as 'Mahakala, the Three Virtuous Brothers'. Each of these three protectors stands leaning towards the right in alidha posture upon a vanquished enemy, a golden sun disc and a pink lotus. They each abide amidst a blazing mass of fire, and are extremely wrathful and blue-black in colour. They all have upward-blazing facial hair, three piercing eyes, a gaping mouth, a twisting tongue, and tawny hair that streams up like fire. As garments they wear robes of red or maroon brocade, a billowing black silk cloak, a belt, leather boots, and the ornaments of a five-skull crown and a garland of freshly severed heads. With their raised right hands they wield heavy red-sandalwood clubs, and with their left hands they hold blood-filled skull-cups. In the background between these three protectors are two skull-cups, one of which contains fresh blood and the other nectar or alcohol.